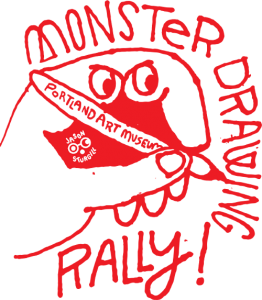 In the spirit of artistic camaraderie and a bit of friendly competition (an exhibition theme in Gods & Heroes), the Museum will host its first ever Monster Drawing Rally (MDR). MDR is a live drawing event and fundraiser featuring more than 75 Portland-based artists. Part performance, part laboratory, part art bazaar, the Monster Drawing Rally is an incredible opportunity to watch some of your favorite Portland artists create original drawings from a blank page. The event begins promptly at 6 p.m. and consists of three one-hour rounds, each featuring approximately 25 different artists simultaneously drawing. As the drawings are completed, they are immediately hung up and made available for a price of $35 each. If more than one person wants to purchase a particular work, the winner will be determined by drawing straws. Proceeds support free school and youth programs at the Museum. The Monster Drawing Rally provides a unique opportunity to watch a drawing come to life, and to purchase a work of art minutes after its completion. Nickbynickjacobs will be spinning tunes, and there will be food and beverages available for purchase. The Museum will also feature the Li’l Monster Drawing Rally, a section where children and families may sit, draw and display their work for the evening. Admission to the rally is free to the public. It’s also $5 after 5pm admission night! Join us inside the Museum for improv, slow looking tours, newly installed exhibitions, and more. Come down to the Suwyn Gallery (the gallery just outside the Whitsell Auditorium) at 6 p.m. for an improv performance by Dream Team. Presented by Kickstand Comedy, this pop-up show will draw inspiration from docent presentations on the Anish Kapoor exhibition. Your improvisers will be: Jed Arkley, Kara Moore, Dylan Reiff, Jeff Kelsay, Briana Nunez-Webb, Justin Himes, Guillermo Martinez. Artist participation in this year’s Monster Drawing Rally is closed. Are you an artist interested in drawing at next year’s rally? Come to the event, and put your name on a list!